Varying quantities of hazardous materials are manufactured, used, or stored at an estimated 4.5 million facilities in the United States–from major industrial plants to local dry cleaning establishments or gardening supply stores. The Emergency Planning and Community Right-to-Know Act requires that detailed information about hazardous substances in or near communities be available at the public’s request. The law provides stiff penalties for companies that fail to comply and allows citizens to file lawsuits against companies and government agencies to force them to obey the law. Between 1982 and 1991, there were an annual average of 6,774 hazardous materials transportation incidents. In 1991, there were 9,069 transportation incidents that resulted in 10 deaths and 436 injuries. 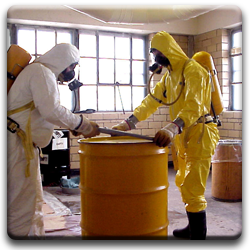 Hazardous materials are chemical substances, which if released or misused can pose a threat to the environment or health. These chemicals are used in industry, agriculture, medicine, research, and consumer goods. Hazardous materials come in the form of explosives, flammable and combustible substances, poisons, and radioactive materials. These substances are most often released as a result of transportation accidents or because of chemical accidents in plants. Publish a special section in your local newspaper with emergency information on hazardous materials. Localize the information by printing the phone numbers of the local poison control center, emergency services offices, the American Red Cross, and hospitals. Interview a member of your community’s Local Emergency Planning Committee about what hazardous substances may be in your community, and by what routes they are transported through the area. Publish a chart of warning symbols and terms. Publish a series on hazardous materials that can be found in the home and the proper antidotes for them. Stage demonstration to show people how to properly seal off their homes by working with emergency building materials such as sandbags, plywood, and plastic sheeting. Most victims of chemical accidents are injured at home. These incidents usually result from ignorance or carelessness in using flammable or combustible materials. The US Department of Transportation employs a labeling and placarding system for identifying the types of hazardous materials that are transported along the nation’s highways, railways, and waterways. This system enables local emergency officials to identify the nature and potential health threat of chemicals being transported into your community. Were a chemical accident to occur in your community, local emergency officials and the fire department would be able to determine the proper emergency response procedures for the situation by the type of placard or warning label. In 1986, Congress passed the Superfund Amendments and Reauthorization Act (SARA) of 1986. Title III of this legislation requires that each community establish a Local Emergency Planning Committee (LEPC) to be responsible for developing an emergency plan for preparing for and responding to chemical emergencies in that community. This emergency plan must include the following: an identification of local facilities and transportation routes where hazardous material are present; the procedures for immediate response in case of an accident (this must include a community-wide evacuation plan); a plan for notifying the community that an incident has occurred; the names of response coordinators at local facilities; and a plan for conducting exercises to test the plan. The plan is reviewed by the State Emergency Response Commission ( SERC) and publicized throughout the community. The LEPC is required to review, test, and update the plan each year.